Potatoes are by far my favorite side dish, no matter in what form! I love mashed potatoes, French fries, oven roasted, and baked potatoes…all sooo good. 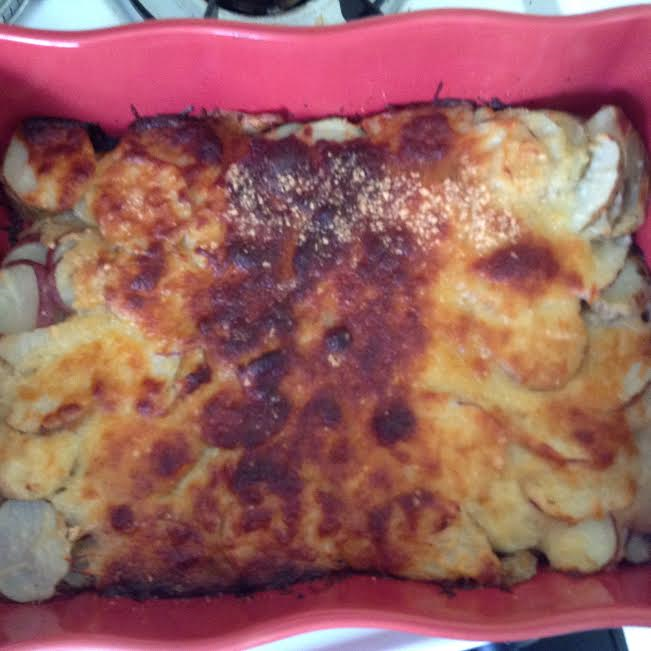 I also really like cheesy, scalloped potatoes, but I have never made them homemade, just from the box. I wanted to try something new, so the other night for dinner I made homemade scalloped potatoes. They were amazing! The recipe was simple to follow; it just took a little long to cook in the oven. So I suggest starting these first before the rest of your meal. In a large nonstick skillet, cook onions in butter on medium heat until tender, stirring frequently. Blend in the flour with the onions, cook and stir 1 minute. Gradually stir in chicken broth; cook 5 minutes or until thickened, stirring constantly. Add 1 cup of shredded cheese and pepper; cook and stir 1 minute or until cheese is melted. Remove from heat. 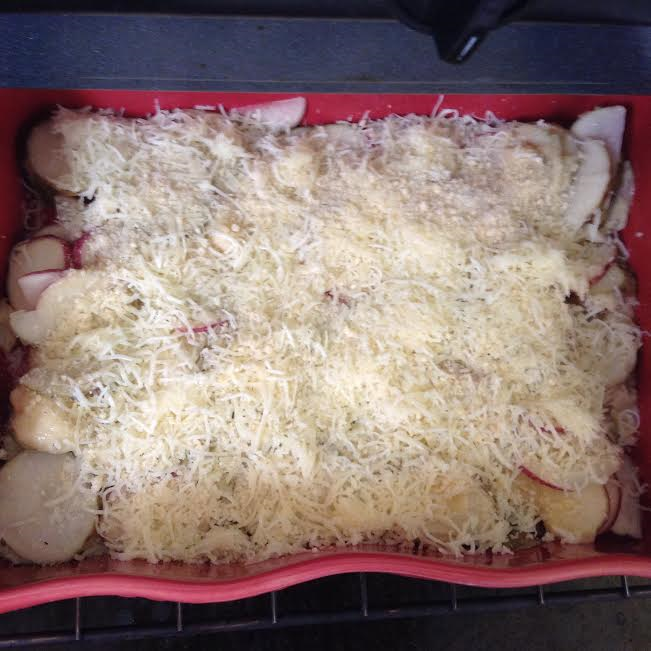 Layer potatoes alternately with cheese sauce in casserole dish sprayed with cooking spray, ending with sauce. Top with remaining shredded cheese and Parmesan; cover. Bake 1 1/2 hours or until potatoes are tender and top is golden brown, uncovering for the last 15 minutes. As you can see per the picture, mine turned out a little too brown on the top. Next time, I think I will cook the potatoes in the oven without the remaining shredded cheese on top, and sprinkle the cheese on when you uncover the dish to prevent this from happening again. Honestly though, they were still delicious and I had no leftovers, so I don’t think anyone minded that the cheese was a little over cooked! This recipe is a great side dish when serving a crowd. It would be delicious with your holiday turkey or ham. If you have any potato recipes that you love, please feel free to share below. I’m always looking for new ways to make potatoes!